Bridge-IT XTRA includes dual power supplies, front and rear panel stereo headphone sockets, 4 GPIO in/outs and aptX® Enhanced as standard. It also includes SD/SDHC card audio backup. Multicast stereo audio over compatible networks to unlimited end-points, or send up to 6 stereo multi-unicast audio streams over WANs like the internet. Tieline MusicPLUS (22kHz) which delivers stereo audio with 20 ms encode delay at 96Kbps, offering huge savings on your data bills. Bridge-IT XTRA will connect to any SIP-enabled IP codec brand with industry standard algorithms like Opus, AAC-LC, AAC-HE, AAC-LD, AAC-ELD, MPEG Layer 2, G.711 & G.722. Bridge-IT XTRA is also EBU N/ACIP Tech 3326 compatible using SIP for connecting to other codec brands and devices. It is also internet/satellite streaming and HD radio compatible. Insert an SD/SDHC card with MP3 or linear backup audio and Bridge-IT XTRA will automatically play out the audio if your IP service fails. 4 control inputs and outputs (DB-15) are provided and the ToolBox web-GUI enables custom control of relay functionality and ancillary RS232 data connections. Uncompressed PCM audio plus other popular algorithms as standard, including low-delay, cascade resiliant aptX® Enhanced* algorithm, LC-AAC, HE-AAC v1 and v2, AAC-LD, AAC-ELDv1 and v2, Opus, MPEG II, MPEG Layer-3, Tieline Music and MusicPLUS, G.722 and G.711. Front and rear panel ¼” (6.35mm) stereo headphone output. 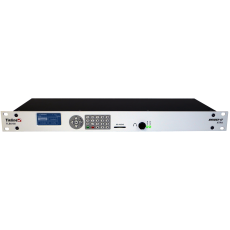 4 relay inputs and 4 opto-isolated outputs plus RS-232 for local and remote control of equipment at either end of your codec link.